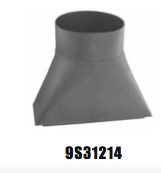 9s31214 is a Transtion Stack that goes from 14" x 3 1/2" rectangular into 8" round. Most use a set of T-bolts or Stack Tie-downs for installation. Gaskets are also available. Will fit some of the following stoves: Apache, Appalachian, Buck, Craft, Hawke, Lilly, Silent Flame, Squire, and more!